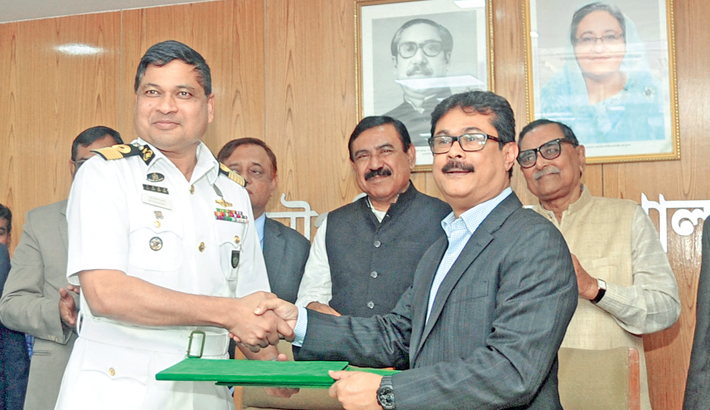 Bangladesh Parjatan Corporation (BPC) Chairman Akhtaruzzaman Khan Kabir and BIWTA Chairman Commodore M Mozammel Haque exchange documents after signing an MoU at the conference room of Ministry of Civil Aviation and Tourism in the capital on Monday. Civil Aviation and Tourism Minister Rashed Khan Menon and Shipping Minister Shajahan Khan were present during the signing ceremony. Meghna Group of Industries Chairman Mostafa Kamal presides over a new logo unveiling meeting of the company at its head office in the capital recently. Energy China NEPC Executive Managing Director of Bangladesh Branch Roy Luo Changqing poses for a photo after opening a new office of the company at Gulshan in the capital on Sunday. NEPC is the first ever any Chinese power plant construction company that set up its own full-phased office in Dhaka. Illustration of the top 500 global fortunes according to the Bloomberg Billionaires Index. Dar Al Arkan Real Estate Development plans to sell a 30 per cent stake in its property management unit on the Saudi stock exchange. Dar Al Arkan Real Estate Development, the biggest publicly traded real estate developer in Saudi Arabia, has received a nod from its board for plans to sell a 30 per cent stake in its property management unit, joining a growing list of regional companies looking to raise funds through initial public offerings of their subsidiary businesses. Berger Paints Senior General Manager (Sales and Marketing) Mohsin Habib Chowdhury and Dhaka University Fine Art Faculty Deal Professor Nisar Hossain are seen signing an MoU at DU in the capital on Sunday. GD Assist Managing Director Syed Moinuddin Ahmed and Imago Sports Co-Founder Tamzidul Islam shake hands after signing a contract in the capital recently. Al-Arafah Islami Bank Chairman Abdus Samad Labu speaks at the get-together meeting organised by the bank at AIBL Tower in the capital on Sunday. Al-Arafah Bank Managing Director Md Habibur Rahman chaired the meeting. LankaBangla Securities Managing Director Mohammed Nasir Uddin Chowdhury and LankaBangla Finance Managing Director Khwaja Shahriar are seen handing over a key of a house to a flood-affected victim of Kurigram district recently. Employees of LankaBangla and LB Foundation of LankaBangla undertook a joint rehabilitation programme for the worst-affected flood victims of different remote areas of Kurigram district. Pubali Bank Additional Managing Director Safiul Alam Khan Chowdhury inaugurates the 462nd branch of the bank at Court Bazar in Rajshahi recently. Prime Bank Deputy Managing Director and Chief Business Officer Md Touhidul Alam Khan hands over a cheque book to a ten-taka account holder of the bank at a function in Tangail recently. Islami Commercial Insurance Company Chairman Md Anowar Hossain presides over the 122nd meeting of the board of directors of the company at Motijheel in the capital recently. Trust Bank Managing Director and CEO Ishtiaque Ahmed Chowdhury inaugurates the Joypara branch of the bank on Sunday. Additional Managing Director of the bank Faruq M Ahmed was present. Member of Parliament Jessore-4 constituency Ranjit Kumar Roy inaugurates an agent banking outlet of Islami Bank Bangladesh at Bagharpara in Jessore on Wednesday. IBBL Senior Vice President Mizanur Rahman chaired the inaugural ceremony. Member of Parliament Feni-2 constituency Nizam Uddin Hazari inaugurates a new branch of Mercantile Bank in Feni on Thursday. Mercantile Bank Chairman AKM Shaheed Reza chaired the inaugural ceremony.